There is a bucket load of adventure waiting for children outside, with the Clear Bucket with Coloured Handle. 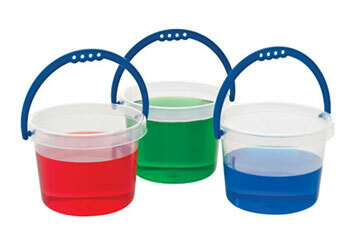 This clear bucket with a coloured handle is a very fun and useful addition to your children&apos;s water play area. Outdoor play can involve sand, water, mud and other interesting materials with different textures and consistencies that can help children get used to different sensations, and increase sensory development for little hands and fingers. Messy play is very creative allowing children the space to explore their imagination and express feelings. It’s also a fun way to increase vocabulary, social interaction, and can provide hours of fun and discovery. This bucket is made from a sturdy plastic, measures 11cm high x 15cm round, and holds just over 2 litres of liquid.